Tim Beyers at FastCompany has put together an article about Cluetrain‘s reaction to Twitter. After all, we’re the “markets are conversations” people, so how do we feel about Twitter and its conversations getting valued at a billion bucks? It turns out that the four of us think different things about Twitter, as Tim indicates in this brief article. My own view is overall quite positive, but compound. I don’t think Twitter is “closer than anything we’ve seen before” to an ideal conversational medium. Twitter conversations are pretty weird because of the brevity of tweets, but mainly because of the asymmetry of the conversation: If the people you’re talking to respond, their responses go to people who may not be following you, and you may not see their responses. In fact, one of the aspects of Twitter I most admire is its ability to work at multiple scales. As Chris Locke points out in the article, at Oprah-scale Twitter functions just like another broadcast, star-based system. But Twitter also works 1:1, 1:2, 1:100, and so on, functioning differently at each scale. That’s true of the Internet over all, but is not true of any (?) other medium. So, I find myself both more positive about Twitter than a casual reader of the FastCompany article might think, but also less enthusiastic than one might take it as saying. Actually, I’d say it doesn’t work well on multiple scales. It’s a broadcast system, and small-scale broadcast can emulate other things. I got a lot of flack from a superficial but-you-can-CHAT rebuttal. However, the point is that it’s driven by broadcasting, not “conversation” in any but the twisted Cluetrain sense of the word. Seth, whoa! Mass mailings don’t scale as widely or as easily as Twitter. They also don;t change their nature at various scales the way Twitter does. Second, please note that I do say that this ability to work at any scale is true of the Internet as a whole, not just of Twitter. So, your Net-based “counter examples” don’t contradict what I said. Third, my post acknowledges the broadcast nature of Twitter at the high scale. Fourth, the FastCompany article reports that a bunch of the Cluetrain authors said that the valuation of Twitter comes from the number of people signed up. FWIW, I told the author the same thing. But that’s not the same as the value of Twitter to its users. OK, let me make my key point more prosaically – Twitter is fundamentally a broadcast system. That should be utterly and completely obvious, as the basic element of Twitter is “following” someone and broadcasting messages to “followers”. 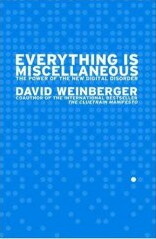 Around recent broadcasting systems, including earlier ones I take you to refer to in the phrase “Internet as a whole”, there is a marketing effort to portray these top-down, one-to-many, interactions as something else – selling them to the masses as something that can be democratic and egalitarian. That’s one part of “Cluetrain”. One aspect of this sales-pitch works off the fact that broadcasting at small scales can be mythologized as among friends and “conversational” – but it’s still broadcasting. There’s a world of difference in the viewpoint of “works at multiple scales” (which is foggy and implies an equivalence), versus “if you have one-to-many broadcasting”, maybe that “many” is just “one” or “a few” (which keeps the attention on the fundamental aspects of the system). And of course, the valuation of a lottery prize comes from the number of people playing it, but that’s not the same as what’s in play with the dream the lottery is selling to its users. Seth, if by broadcasting you mean a message sent to more than one person, then yes, just about everything done in public is broadcasting. But that slights important differences. For example, the yearly newsletter sent out by families around the holidays certainly can be counted as a type of broadcasting. But to leave it at that, and to not see any difference between that and NBC broadcasting The Andy Williams Christmas Show is to miss much that is important. So, yes, Twitter is only weirdly conversational. I believe that’s what I said in my original post. Twitter’s a bad example of conversation. But it’s also not pure NBC-style broadcasting; it is at the high end of the scale, but it’s different at smaller scales where there is more mutuality in the sets of followers, where there is more likelihood that you’re following a person because you know her outside of Twitter, where there’s more possibility of responding to responses, etc. Seth, you seem to me to be as insistent on reducing everything on the net to broadcasting as you accuse me of reducing (inflating?) everything to conversation, even as you reduce everything to broadcasting. But this post is exactly not about reducing everything to conversation. That Twitter enables people to feel they are having a ‘conversations’ does not make it so! Cluetrain did provoke us into looking at markets as conversations, and as swirls of passions awaiting engagement and willing to respond to a product, issue or crisis. And over the last decade there are many examples of Cluetrain style renovations to public relations, advertising and marketing. All good stuff! In these cases, the conversations are longer than a series of 140 grunts! (Twitter should rightly be called ‘Grunter’!) to capture it’s depth (sic) of conversation. And notwithstanding that some grunts of famous people might indeed garnish a ‘following’, is this what we have come to? But we can go deeper. 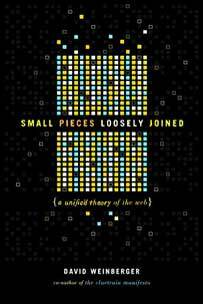 The compelling title of the post Cluetrain book: Small Things Loosely Coupled says it all! We are currently living through a (probably momentary) process of internet *centralisation* in the hope that ‘conversations’ can be directly monetization. A Twitter decentralised looks more interesting (See the rssCloud work or the so-called ‘push-button’ internet). But then we see that these style of services are really notification services, which in real time, enable loosely coupled work-flows to be instituted across the internet close to real-time. That will indeed be radical. But alas, I can’t see Twitter being part of it. It’s very centralisation is prompting loosely coupled architectures to be built as an antedote to such crass control. A notification is not a conversation. Finally even using your net neutrality arguments there is an implied critique of Twitter: they can define ‘SUL’s and play favorites with twitterers (broadcasters!). Is that ‘internet savvy’ or good old fashion payola? Then I’d say that, overall, #1 is much more accurate than #2 – especially in the analytic contexts like we have here. Of course these are simple models. But when you say “Seth, you seem to me to be as insistent on reducing everything on the net to broadcasting as you accuse me of reducing (inflating?) everything to conversation …”, I’d rebut this is an example of deeming approximations equally bad just for being approximations. That is, approximating everything in an interval (1 – many] as “many” is not strictly correct, but it’s a lot better than approximating everything in an interval [2 – many] as “2”. Seth, if you could keep the ad hominem out of it, that would help. I’m not saying the two approximations are equivalent. I’m pointing to my current post as being something more subtle than an approximation. Its point precisely is that Twitter has different characteristics and twitterers have different motivations based (in part) on what scale they’re are. I am very distinctly NOT saying everything is a conversation; I say it is a broadcasting system when used at Oprah scale. So, I’m not saying we’re both being equally reductionist, to which your reply that not all approximations are equal would be appropriate. I am not saying “Everything is conversation, and that’s the end of the story,” but you do seem to be saying that everything (involving more than one person) is broadcasting. I think you’ve picked a bad post as evidence of your point. David, I don’t mean to do an ad hominem deductive fallacy. But … considering the post portion “After all, weâ€™re the “markets are conversations” people …”, noting the influence of marketing of conversation seems relevant (also, personally, note my Twitter column goes into how very much I don’t want to be a sucker to the whole new game being run by the conference/startup complex, to waste huge amounts of time and energy so they can make a few pennies selling me). I truly don’t want to offend you personally, but Cluetrain sells a particular view which I oppose vehemently, so of course that’s a difficulty when arguing with one of its authors about it. Anyway, there’s two different matters. Equally reductionist was what I viewed you as saying in #comment-49903 above. We got there because my criticism of the post was that Twitter is best approximated (in an acknowledged very very simple model) by “broadcasting” at almost every scale, and my claim is that you’re usng an approximation which STARTS FROM “conversation” and hence ends up being very misleading (not saying that everything *is* a conversation).